Blacklaw Vogue is our homebred Knabstrupper mare standing at 15.2hh. 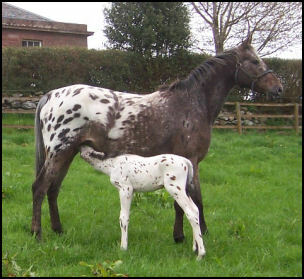 As a foal she was very sick with joint ill and has been retained as a brooodmare. She is an elegant mare with a sensible temperament. 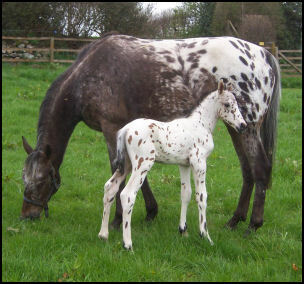 Vogue was graded with the KNN in 2010 after producing her first Knabstrupper colt foal. He was awarded a First Premium with a 9 for frame. Her Sire is the outstanding 2008 Hanoverian Stallion of the Year DE NIRO. 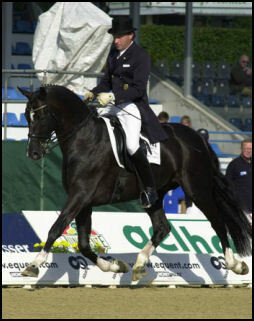 In 2010 De Niro was ranked 5th in the World's Best Dressage Sires and is without doubt one of the top stallions today. By the age of seven De Niro was already competing Grand Prix. As a Sire he has been a huge success with over 60 Licensed Stallion sons. He has too many successful progeny to list here but four currently doing exceptionally well are Desperados, Delgado, Dablino and Voice. Her Dam is the superb purebred Knabstrupper mare Vixen KNN1608. Vixen has been Silver Medal awarded for her offspring. She was a tall sports type mare who had 18 foals, was broken to ride and drive whilst staying sound all her life. 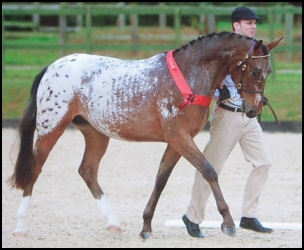 Vogue is a full sister to Blacklaw Vice Versa who has twice been awarded 9 overall and Best in Show at the KNN gradings. Blacklaw Vero 2010 Knabstrupper foal by Xhogun Middelsom. Blacklaw Vice Versa. Full sister to Vogue.